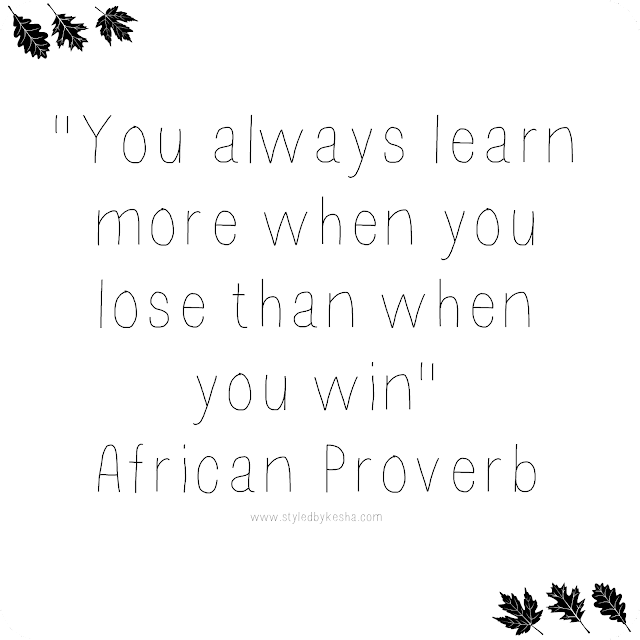 Why is this African Proverb so true, " You always learn more when you lose than when you win." Its a statement that resonates after the loss or the lesson, or the failure. I have learned a lot through my mistakes, my losses, my failures and i can say they have made me a better stronger person. For this #mondaymotivation I wanted to focus on what I learned this month. It's theme was investment. And what you need to do to improve yourself to be great. One of the lessons I have learned that everything takes effort. Investment takes patience, consistency and daily research to improve your odds to get even better. When we put effort toward anything sometimes we win and sometimes we fail but we learn from our mistakes more than ever. That is if we are willing to admit our wrongdoing and want to get better and persevere through the challenging trial or lesson. We learn new strategies, we adapt and we try again. Knowing that there is an equal chance that we might fail again and there is a great reward at the end. It is worth the risk because the dream is bigger than the trials and challenges. Through the valley is the only way we build stronger stamina and character as we mature, we dig deeper to create stronger roots all before the world gets to see the fruits of our hard working, long hours, no sleep labor only to come in during the harvest season. We always learn when we don't succeed. We just have to look at each set back as a way to a comeback. When you lose its a chance to be authentic, honest, pick yourself back up, be vulnerable which is the greatest strength and know that it takes courage to grow up and become who you really are. That is when you win, when the lesson is learned and applied. Everyday is a new day to learn something new. To build your character and share your experiences with others.